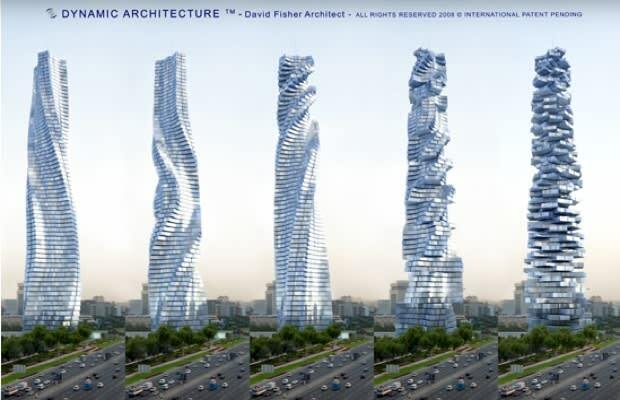 Seeking to design a space where you could see sunrise and sunset from the same room, Italian architect David Fischer designed a building where each of the 80 floors rotates by voice command. Solar panels and wind turbines power the three-hour full spin. Almost the entire structure will be pre-fabricated offsite, cutting typical construction time from six weeks per floor to six days per floor. While Fisher claimed that two towers would be complete in 2010, no ground has been broken in either of the rumored locations and no official announcements have been made.